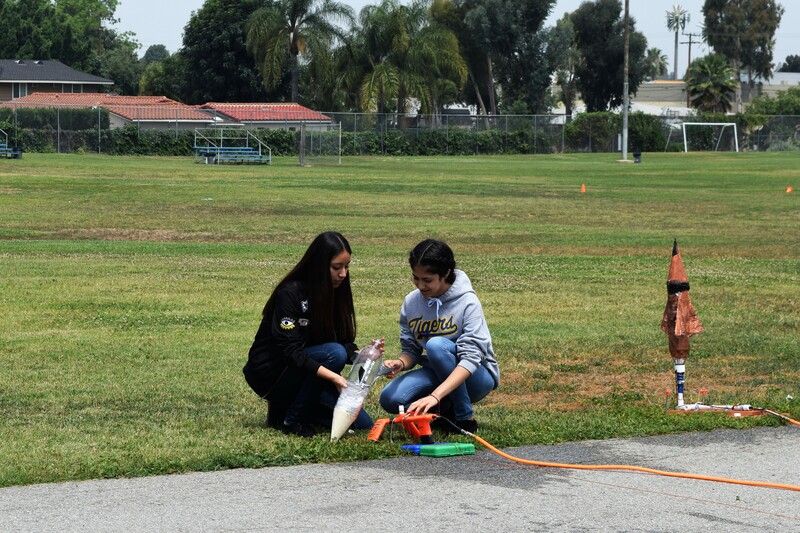 EAST WHITTIER – Hillview Middle School seventh-graders took to the campus field for a hands-on learning experience, using math and science concepts to launch water rockets on May 24. 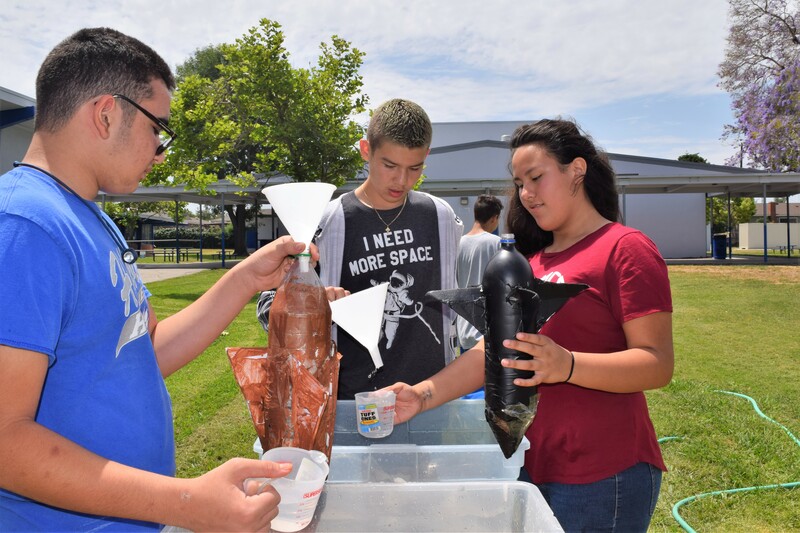 More than 140 students participated in the science, technology, engineering and mathematics (STEM) activity, with science and math classes combining disciplines to calculate the trajectory, flight time and altitude of the rockets. Students spent two weeks designing and constructing their rockets. In pairs, the seventh-graders created the water rockets using two-liter plastic bottles, duct tape and cardboard. Fins were constructed for the base of the rocket and a nose cone was secured on top to enhance stability during flight. Three pairs set up their rockets on wood platforms connected to an air compressor, and tied a string to the launch pad. The rockets were propelled in to the sky using a combination of pressurized water and air. While the science students worked on engineering elements to design and test the rockets, math students observed to measure altitude and flight time. An art element was also applied to the activity with students designing their mission patches for the rockets. A sixth-grade class viewed the demonstration to understand what will be expected of them next year. Hillview science teacher Marc Rizzo has coordinated the event for the last five years, and this year decided with math teacher Michael Hollon to combine both subjects for the rocket launch day. Those unsatisfied with their launch, were offered a second chance to redesign the rockets and test them again after school. 052517_HILLVIEW_STEM1: East Whittier’s Hillview Middle School seventh-graders fill up their water rockets before they are launched using a combination of pressurized water and air. The afternoon of rocket launching is part of a science, technology, engineering and mathematics (STEM) activity. 052517_HILLVIEW_STEM2: In pairs Hillview seventh-graders prepare their launch by securing the rocket on a platform connected to an air compressor. Students in math then calculated the altitude and flight time of each water rocket. In pairs Hillview seventh-graders prepare their launch by securing the rocket on a platform connected to an air compressor. Students in math then calculated the altitude and flight time of each water rocket.